A few weeks ago, I posted a photo in my Combi Steam Cooking Facebook group, of a combi steam chili dish about to go into the oven. It wasn’t pretty – just a lump of raw brisket in a pot, surrounded by spices, tomato and onions – but it got quite a few group members talking and some tried their own version with great results. We all need as many fast-prep dinners as we can get, so I thought I’d share my recipe here. The idea is similar to a slow cooker chili, and I thought it would be perfect to adapt to a steam oven. I was right – the steam oven becomes the slow cooker, only better, because it takes about half the time a slow cooker version would. Also, the high moisture level in the steam oven means there’s almost zero need for added liquid save for a little tomato puree. The meat just cooks to fall-apart perfection in its own juices and tastes all the better for it. I’ve mentioned this before, but slow roasting and braising are some of my favourite ways to cook in my steam oven, because they take so little effort and provide such a great return. I slow cook a large joint of meat at least a couple of times a month, partly because we just like to eat it, but also with the ulterior motive of freezing leftovers for later. Two meals in one is exactly how I like to roll, especially when their total prep time rarely exceeds 10 or 15 minutes. Yes, it might take hours in the oven, but the attention you need to give this while the magic happens is so little, apart from perhaps refilling your oven’s water compartment if you don’t have a plumbed model. I don’t even chop my vegetables properly for this recipe. They fall apart and melt into the finished dish, so it’s one less thing to worry about when you’re preparing to put your chili in the oven. The finished chili is soft, tender and shreds easily with the merest poke from a fork. And the flavours are outstanding. 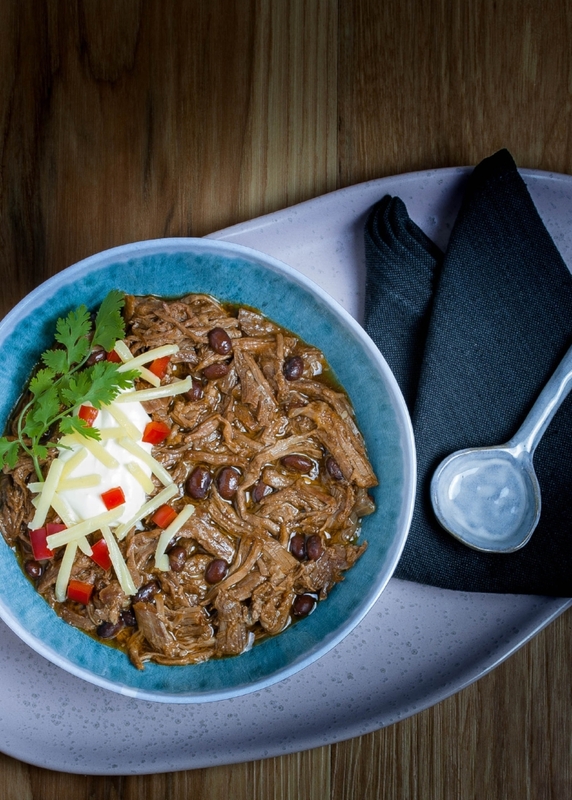 It’s complex and warming immediately after cooking, and even better reheated after a night’s rest in the fridge (the chili, not you, although if you’re sweltering in some parts of Australia at the moment, you might enjoy climbing in with it). It’s exactly my kind of recipe, equally at home as a lazy weekend dinner with friends, or a weeknight meal where you can batch cook and freeze the leftovers. Once it’s made, all you need to do is stir in a can of beans and add sour cream and cheese, and you’ve got dinner. Salsa or hot sauce completely optional, though we like it spicy around here. I call this cheat’s chili because I’ve removed all the time-consuming steps you might usually follow, stripping it back to its barest components while still delivering big taste and texture. There’s no fine dicing of vegetables, no browning of meat, no toasting of dried chiles. Tex-Mex purists (is there such a thing?!) may be horrified, but if you just want to get dinner in the oven, this is the way to go. Feel free to add roughly chopped bell peppers or grated zucchini to the pot if you want to boost the veg component. My concession to gourmet ingredients is the dried Ancho and Guajillo chillies, which I really recommend not for heat, but a smokiness and depth you won’t get otherwise. They are available to mail order and better supermarkets or gourmet stores often carry them. If you can’t get any, an extra ½ tsp of regular chili powder will bring extra heat if not the complexity. We serve this in a few ways. Ladled into a bowl and topped with sour cream, cheese, diced peppers and coriander is my favourite, but the boys in my house are fans of a build-your-own taco dinner with this as the meat base. When there are leftovers which need to be stretched, we use it as nachos topping with (too much) cheese and diced pickled jalapenos. 1. Put the meat, fat side up, into a deep casserole dish or stainless steel pan. Tuck the garlic, onions and chillies around the meat. 2. Mix the tomato puree, spices and salt in a small bowl, then pour this around the meat, over the vegetables. 3. Put the dish into the oven and set to 120°C/248°F, combination steam setting. If your oven has variable steam settings, use 80%. There’s no need to preheat for this dish. Cook until the meat is falling apart tender and the vegetables have broken down, about 3 ½ to 4 hours. 4. Let the cooked meat sit for 20 minutes, then shred with a couple of forks, discarding any large pieces of fat. Stir through the drained beans and serve as you like (suggestions above). Any leftovers will keep refrigerated for a couple of days or frozen up to 3 months. And if you’re after more delicious make-and-freeze combi steam recipes, the Easy Meals Index page has plenty. Try the Cauliflower and Pumpkin Soup, or one of our enduring favourites, Jamie Oliver’s Beef Kofta Curry.